Begun in 1762, and completed in 1773, the St. Ursen Cathedral has long-served as the focal point for both worship and tourism in Switzerland’s most significant baroque town. In early January 2011, someone set a fire which wreaked massive damage throughout the Cathedral’s 2000 + sq. ft. congregation hall. When the smoke cleared, the entire white/gray lime rock interior, which had shone like marble for centuries, was encrusted with a foul grayish residue. The Cathedral was closed to the public and a plan for restoration developed. The situation was carefully assessed; extensive tests and studies determined that a full cleaning and repair of all surfaces was a prerequisite to restore the damaged room to its former glory. The restoration operation commenced under the direction of Pius Flury and Iwan Affolter of Flury und Rudolf Architekten AG (Switzerland). The project encompassed every aspect of the building: surfaces, art, lighting, heating, electrical, and the electro-acoustics infrastructure. 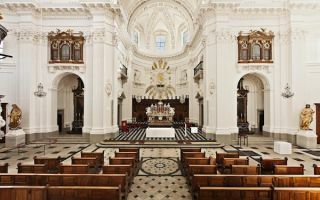 St. Ursen Cathedral, which has served as the Seat of the Roman Catholic diocese of Basel since 1828, is graced with a number of extraordinary aesthetic assets. These include: Stucco by Francesco Pozzi; a carefully preserved ancient Cathedral Treasury (on display in a separate museum), a remarkable High Altar, comprised of eleven different types of marble; two fully independent organs, both still frequently used for concerts; and 11 church bells from the mid 1700s, the largest of which weighs over 4000kg (8800 pounds). In a fortunate coincidence, the Walters-Storyk Design Group’s European headquarters are located in Basel, a short drive from Solothurn. Company Partner/ European GM, Dirk Noy, was very familiar with the Cathedral, and honored to be awarded the electro-acoustical portion of the project. Adding another coincidence to the story, Noy and WSDG had played a key role in the electro-acoustical restoration of NYC’s Central Synagogue after that iconic house of worship was reduced to a burned-out shell following an accidental construction fire in 1998. WSDG began conducting extensive acoustical measurements, to obtain a “status quo” documentation and to serve as a base for the predictive simulation software findings. Although RT60 Reverberation Times exceeded 6 seconds at 500Hz – and a reduction would have been helpful to achieve improved speech intelligibility, changing the materialization of the building was unacceptable. Further complicating the project, new measurements taken following the initial restoration revealed that the RT60 Reverberation Times were even higher after the accumulated dirt and gray burn residue were cleaned. To resolve this challenge, WSDG specified various Stoll Audio loudspeakers along with a total of eight CVS Clearvoice Evolutone (2x 3000, 2x 2000 and 6x 1000) steerable array loudspeakers. These recommendations were based on the speakers long-range throw, highly sophisticated steering algorithms and high speech intelligibility, all of which were vital to reach the target values. The loudspeakers are driven by a networked BSS Soundweb DSP backbone, and controlled by a Crestron touchpanel. Gateways to other building management components (lights, heating, church bells etc.) were also stipulated to facilitate full building control from a centralized panel. Other technical components selected for the renovated system include: Beyerdynamic, and Shure Microphones; and Lab Gruppen Amplification. The System Installation was undertaken by the local specialist team of Gfeller Licht- und Tontechnik AG under guidance of Stefan Gfeller. Dirk Noy reports that a number of custom solutions were engineered and implemented, to meet the sophisticated demands of this system upgrade. These included auxiliary in-and outputs for broadcast trucks, exterior courtyard locations and a time-critical audio/video monitoring and communication system for the dual organ players who are positioned 1/5 second (60m - 200ft.) apart while performing their duets.